And the roller-coaster weather continues. Wednesday evening we got all the wet, heavy snow, and yesterday it was a pretty awesomely beautiful day. But this morning we woke to sleet, giant snow flakes that weighed at least 9 pounds each, and then things turned to rain, sleet, back to snow, and now we are just getting pummeled with such hard rain that I can’t hear the music playing on my iPad. Our metal roof and roof windows transfer the sounds very eloquently! 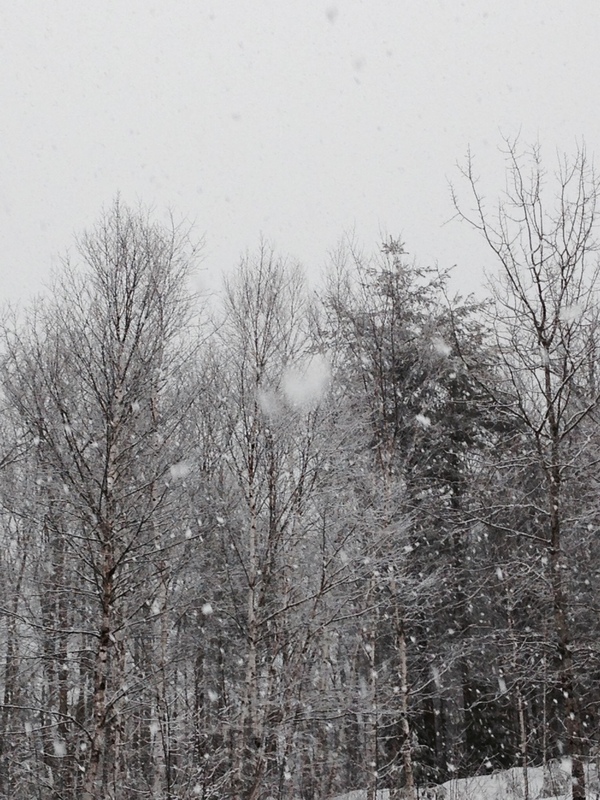 Snow and rain mixed. Yuck. I love the sound of rain on the roof, but I have to say that this is a little over the top for February. We are even getting thunder along with it! 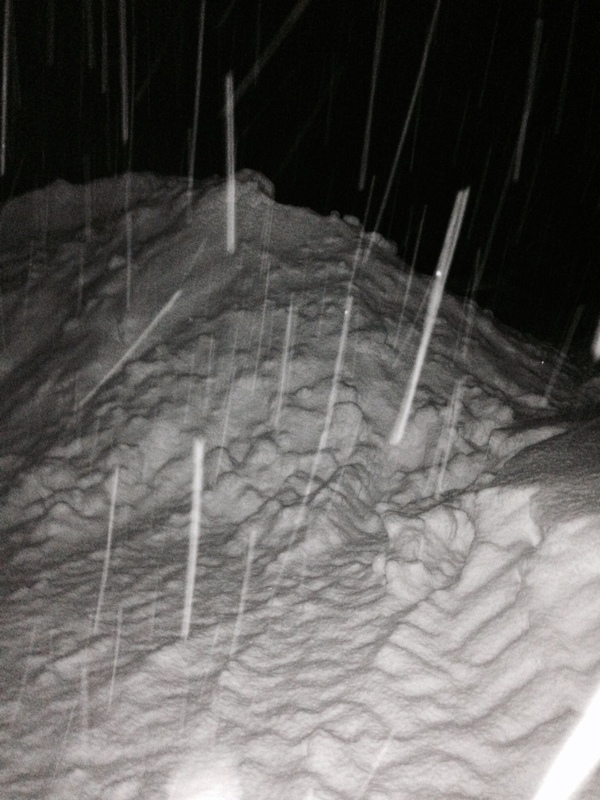 They predicted some ‘thunder snow,’ but not this relentless rain. Yuck! I can hardly wait to see what the conditions will be out in the paddocks tomorrow morning. I hope it doesn’t get cold enough to make a field of glare ice. Sigh. 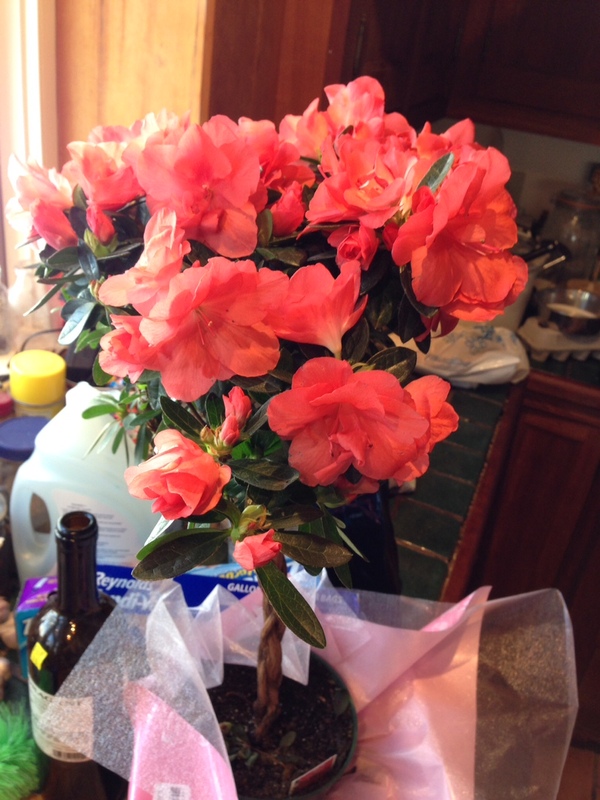 The Azalea. Spring in a pot! Along with the autumn inevitably come the trips to the butcher. 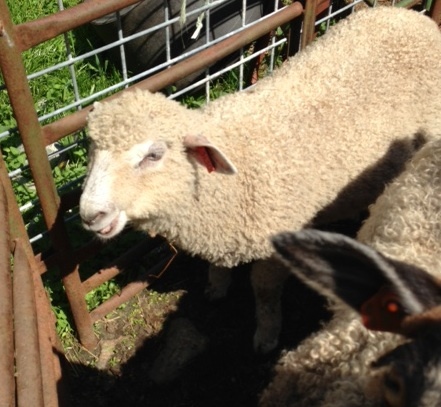 We did not have as many lambs this year as usual, and the last three who were not sold at weaning, are ready to go. 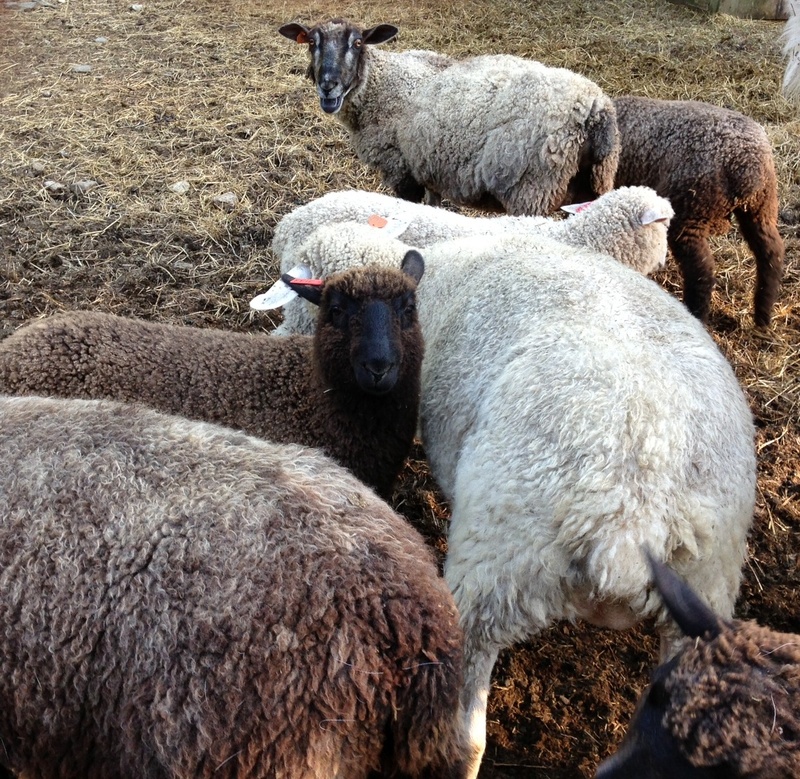 Before that happens, however, I have to decide if I am going to take their fleeces off to use in yarn, or leave it on and process them as pelts. The disrepair of our greenhouses has pretty much decided this question for me. 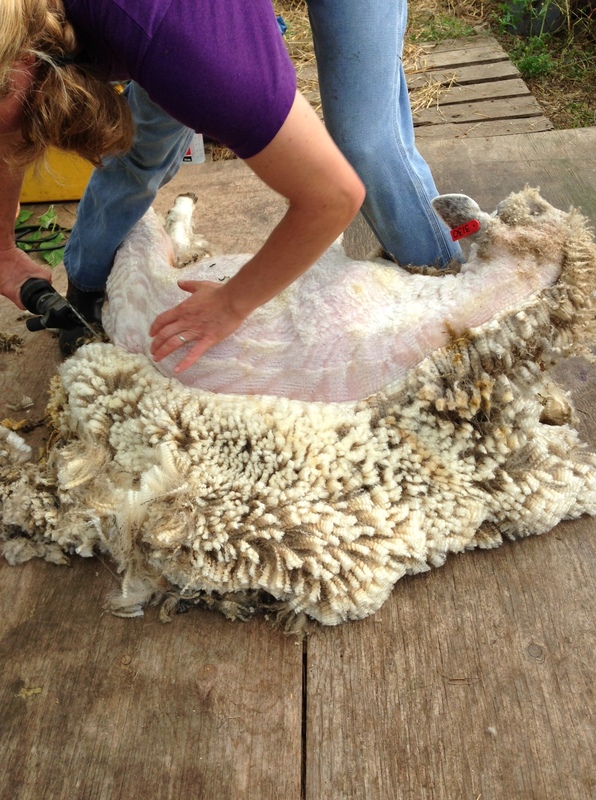 Salting and drying the pelts before sending off to the tannery has become very difficult (due to the tears in the greenhouse covers), so I had our favorite shearer Emily come yesterday. Luckily, the weather cooperated with us and they were nice and dry when Emily got here. It was a quick visit, and the three boys were actually a lot cleaner than I expected, even though they have been eating hay and exposed to some muddy situations. My next job is to sort all the fleeces we have upstairs and make some decisions about what to make into yarn or roving, and which colors to combine or not. Then to send it off to the mill. I really need to get this under control, we can barely get from the top of the stairs to the bedroom up there! I must have sprained my head before I sprained my ankle. Another notch in my klutz belt, I guess. Wednesday afternoon as I was going out to chores, I paused on the back steps as my husband called to me about something. 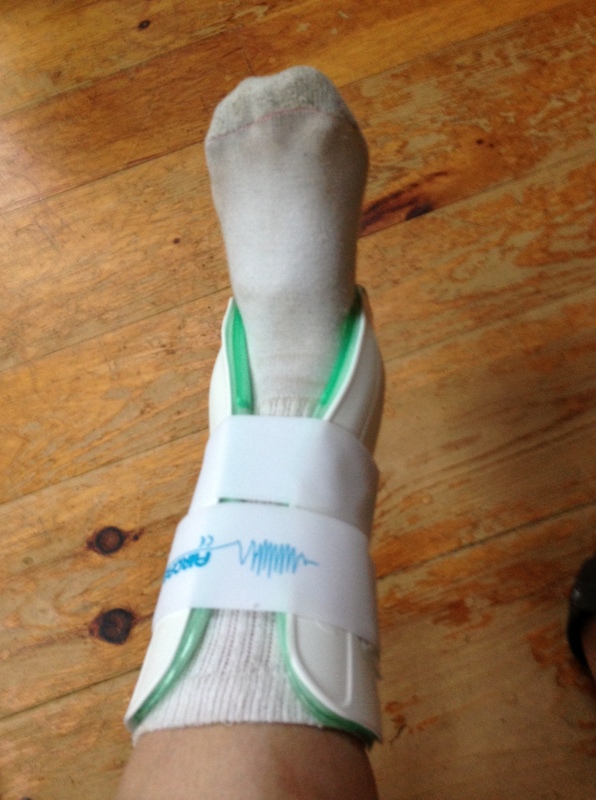 When I got moving, I think I forgot that I was not on the bottom step, landed on the side of my left foot and went down. And so it goes. At least there are no broken bones! Of course the sheep and goats hate a schedule change. By the time we got home from the hospital on Wednesday evening, they were not happy. Particularly not happy to see John instead of me. Well, most just were annoyed at the late dinner hour. SnowPea, however, had a tantrum and wouldn’t let her milk down for John. She is a funny girl. I figured that by the next morning she would be uncomfortable enough that she would let him milk her. Same story again. So by Thursday afternoon I talked John into driving me up to the greenhouse. SnowPea was a little alarmed at the crutches, but she was more than grateful to see me. She kissed me as she got onto the milk stand. Foot is much better this morning. I am tired of sitting and anxious to get back to all the things I need to do. We had the shearer scheduled for this afternoon with our 3 ram lambs, but all the rain we have been having combined with my gimpiness has put that off. Luckily, the long range forecast for next weekend looks good. So Emily will join us just in the nick of time, as the boys go to the butcher the next morning. Phew! Usually it all comes together in the end, but sometimes the cliffhanger is a killer! Yesterday was bright and warm, and as we were able to get an able-bodied teenager to come over and work with us, it was time for some winter fencing prep. The boy’s area was cobbled together last November at the last moment, we had not expected to be using that side of the paddocks. So the green panels and galvanized panels, as well as the gates, were very hastily put up and they have been questionable ever since. 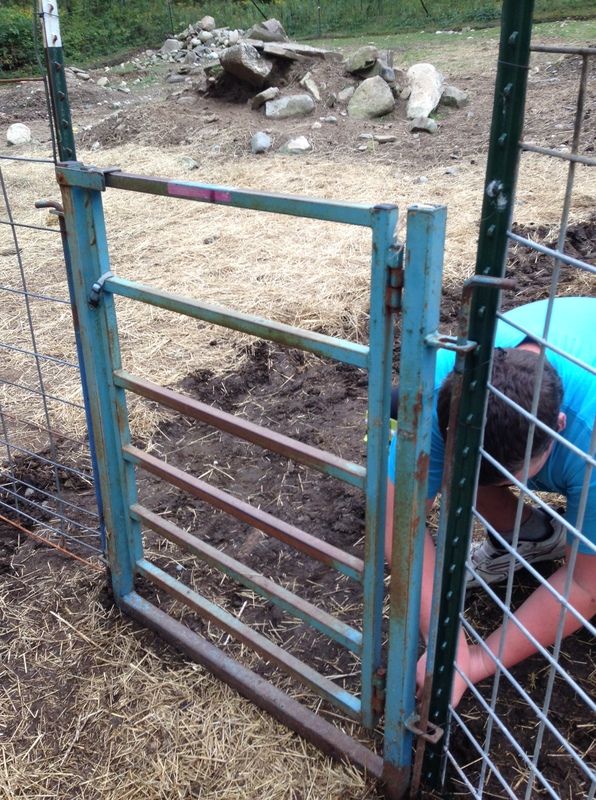 So it was time to get some of the 16′ cattle panels set up, finally. The problem with those is that we need to pound green t-posts in to hold them up. That’s usually the point where I have to walk away. I can pound posts in in some parts of the paddocks, but where the boys are is a little rockier, and the earth is shallower there, over the granite outcropping. So it’s a tricky one. And someone with more power on the sledgehammer needs to be working with me! My step grandson came over and we got to work. It was difficult, but we got it in the end. 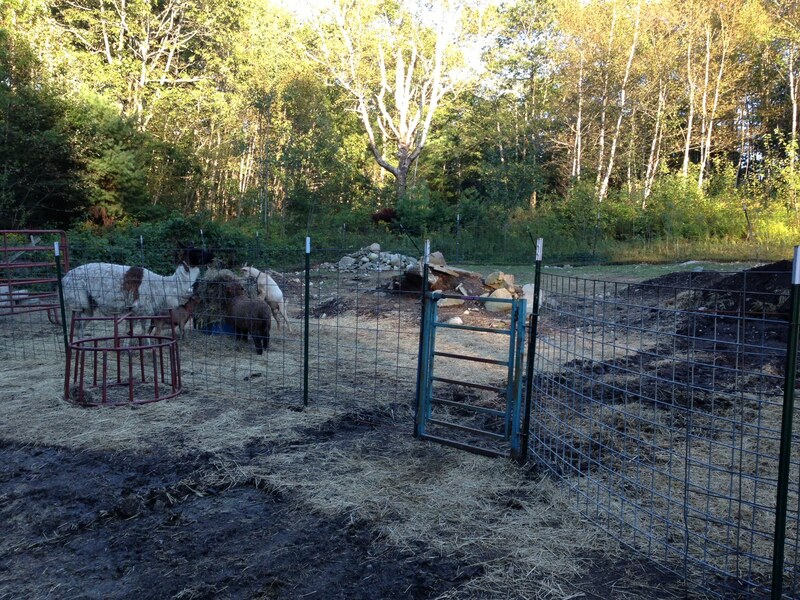 We moved the perimeter back a little bit so it’s easier to get a truck in and turned for deliveries and animal pickups. And we really nailed the gate, I think. Wow. What a relief! I still have more work to do on the other pens, but this was a huge step in the right direction. Of course, today I could barely move my arms, my shoulders hurt, and, well, everything aches! And I feel like I am coming down with a cold, but am hoping it’s just allergies. The ragweed is really bad right now, and the wind has picked up. So it was a good weekend. Today I got a little reading and resting in. After the rain let up it was a gorgeous but cool day, windy and bright. It really is getting on to autumn. Unfortunately, we still have a 90 degree day or two to go this week. But it’s almost time for the 3 lambie boys to be leaving us, off to freezer camp. The milestones of the year are definitely clicking by. It’s been a long one, that’s for sure. Still gimping around, although my back is very slowly getting better. I can mostly walk up the driveway without too much trouble, but still no lifting at all, and I need lots of rests in between. I took over milking SnowPea but can’t carry the bucket back up to the house, so I must depend on John for that. I think the massage that nearly killed me on Monday definitely loosened things up! One of Esther’s very curious boys! It really doesn’t take much! I had a great time outside yesterday taking photos. 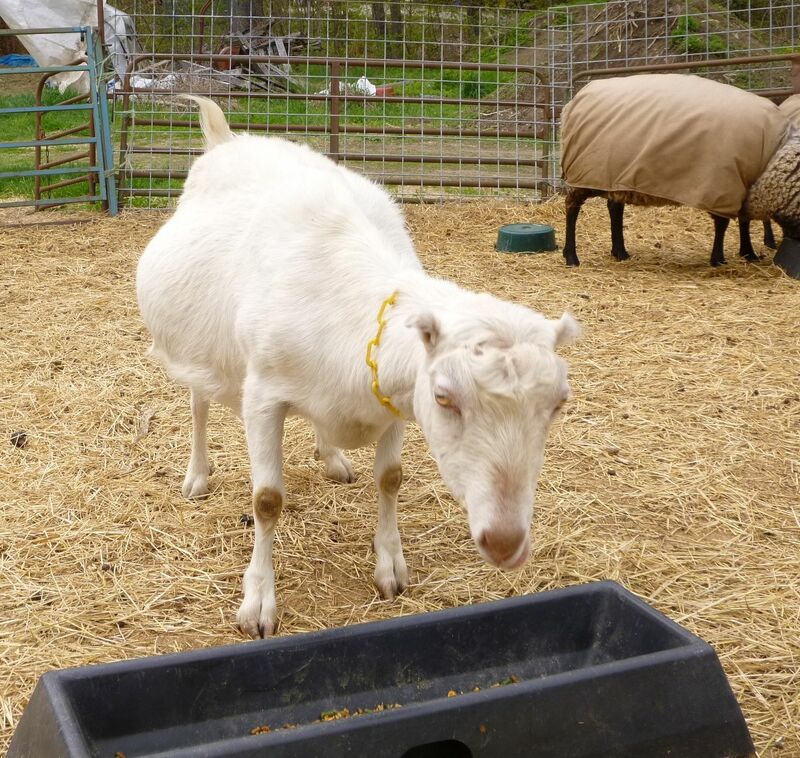 I don’t manage to grab the camera every chore time, and frequently I wish I had it with me as one of the sheep or goats is frequently doing something cute or funny. 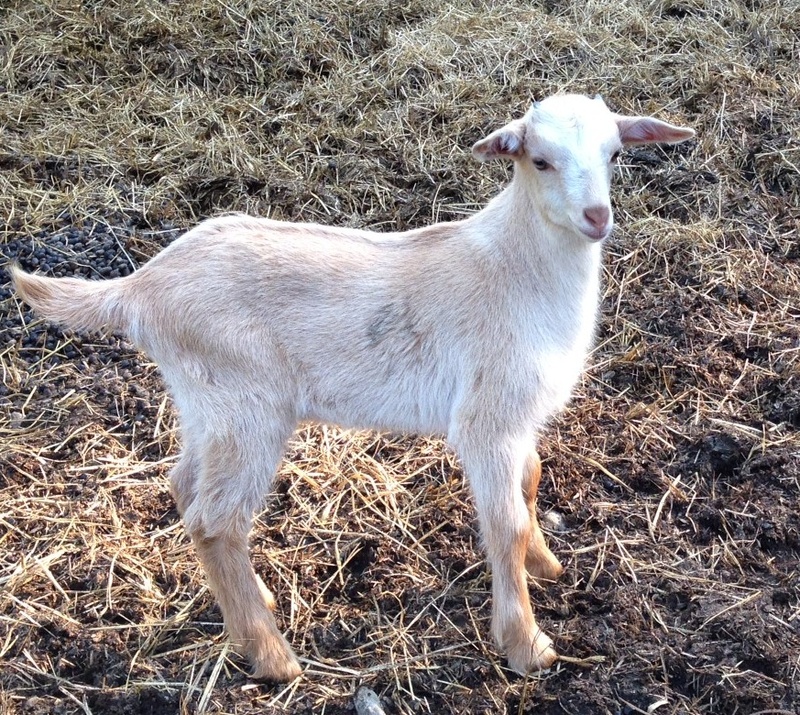 SnowPea the goat is getting rounder by the day. Her due date is at the end of May, so I am pretty sure she really is going to give us some kids. 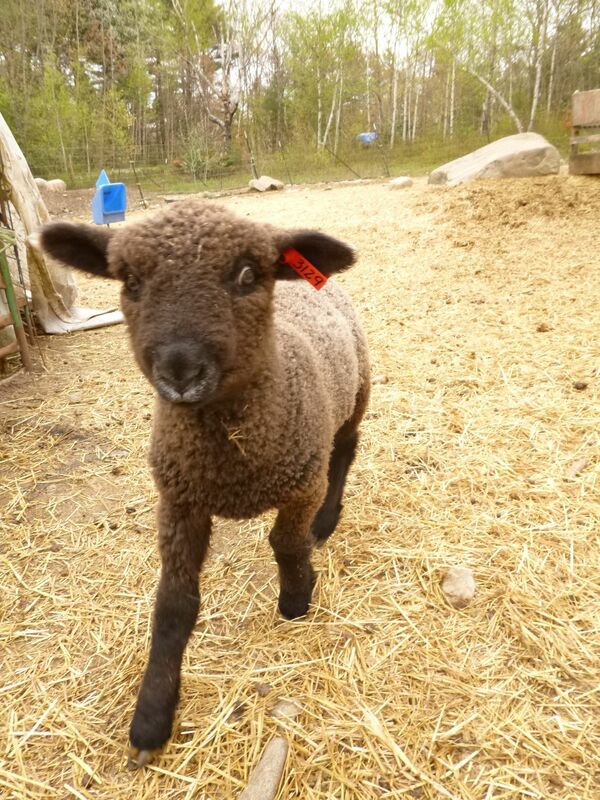 The lambs are growing like hotcakes and their moms are not being as solicitous with feeding times. They are just about 6 weeks old now. I can’t believe it! Pretty soon it will be weaning time. Esther trying to extricate herself! We never look forward to rainy weekends, but since we can’t order up the weather, it gave me the incentive to get some things done around the house (and, the fire danger is so high it was a good thing). I needed to make a batch of soap, so that was first on my list for today, and then I spent most of the afternoon in the kitchen doing all kinds of things. 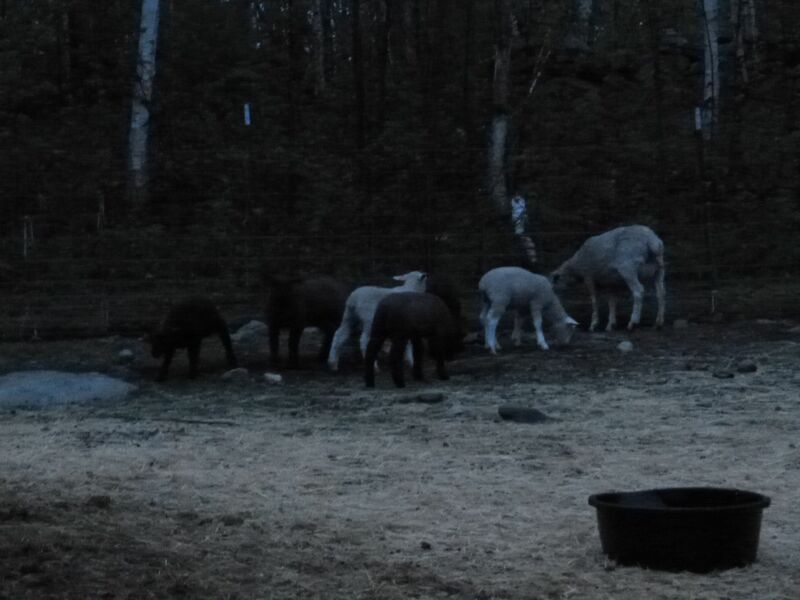 This evening John was outside checking on something and he came in and told me that there was a lot of baaing going on up in the paddock. I stuck my head out the back door and couldn’t hear much, but the wind had really come up and was gusting pretty hard. Sometimes the wind is enough to unsettle the ewes, but instead of simply wondering about it, I took a walk up there and spent some time in the paddock. It wasn’t raining at that point, the lambs were playing hard up at the top of the hill, and the ewes were calling to them, without much response. A lot of jostling and jumping going on and I tried to take some photos in the twilight. Couldn’t get the action shots, but when they stopped jumping around for a moment I got a fairly decent picture of them wondering what I was doing out there at this time of night! 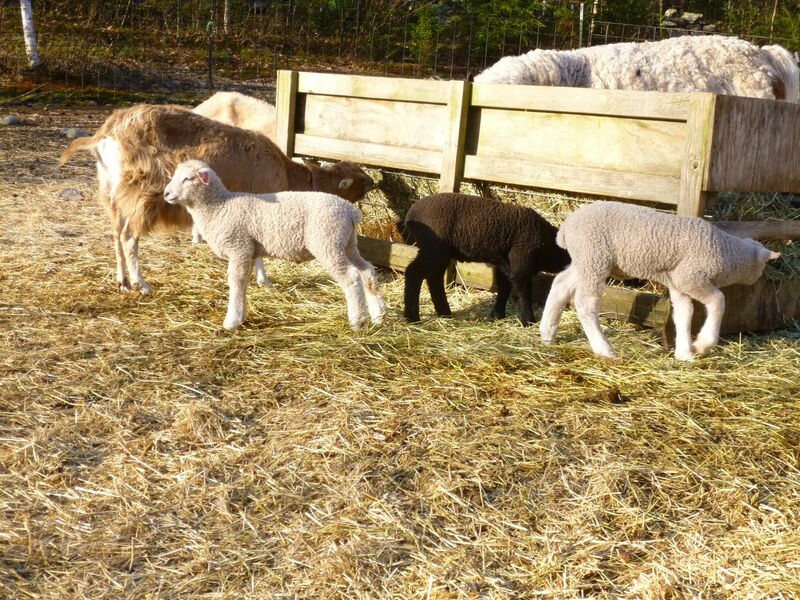 Lambs are one month old already! Wow. That truly went fast. Yikes. I had intended to do the first CD&T shots at about 3 weeks old, but time got away from me (Enterotoxemia and Tetanus caused by the toxins of Clostridium. perfringens types C and D and Clostridium tetani – taken from the label on the bottle, Bar-Vac). 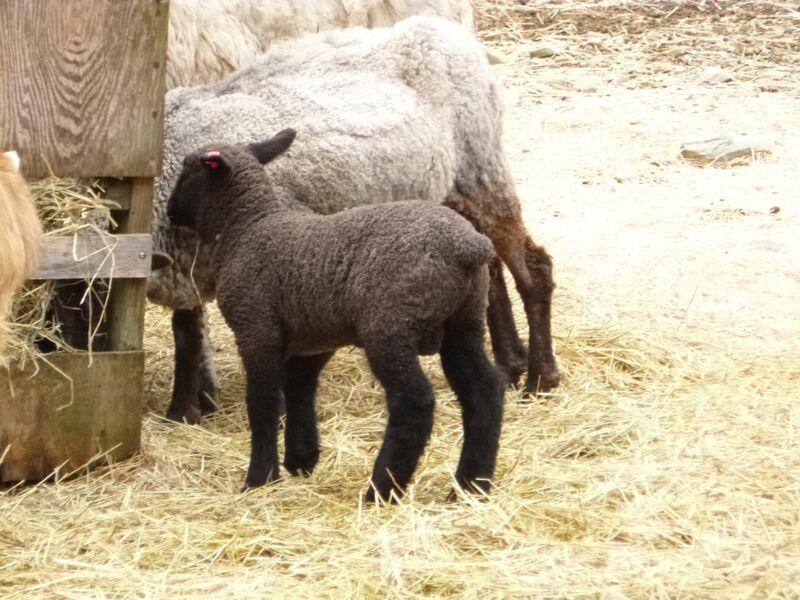 Most of our lambs will be going as meat animals, and the rams are not as apt to be brought down by Clostridial infections, but the tetanus is what I am after for them. For the ewes, all of it is really important. 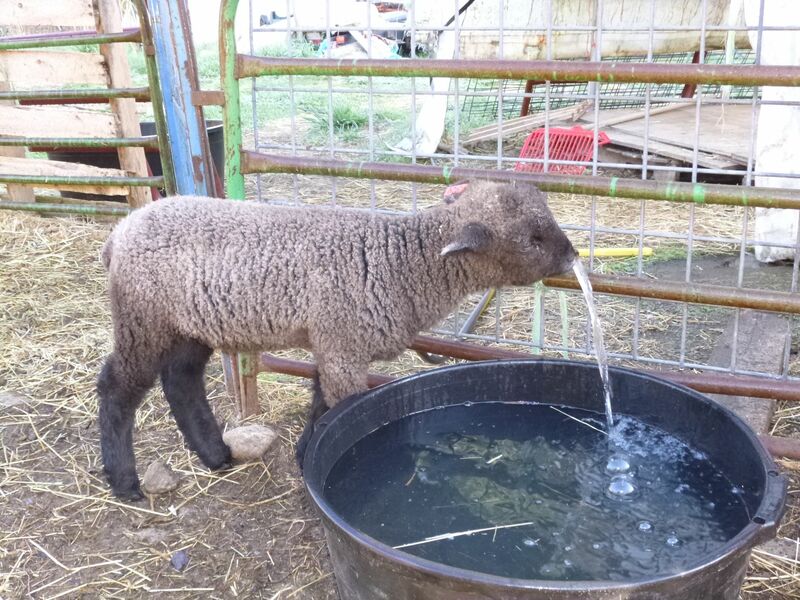 Traditionally the lambs get two doses: the first at one month and then again at two months, but lately we have been reading about doing the shots a little bit earlier and possibly doing three. 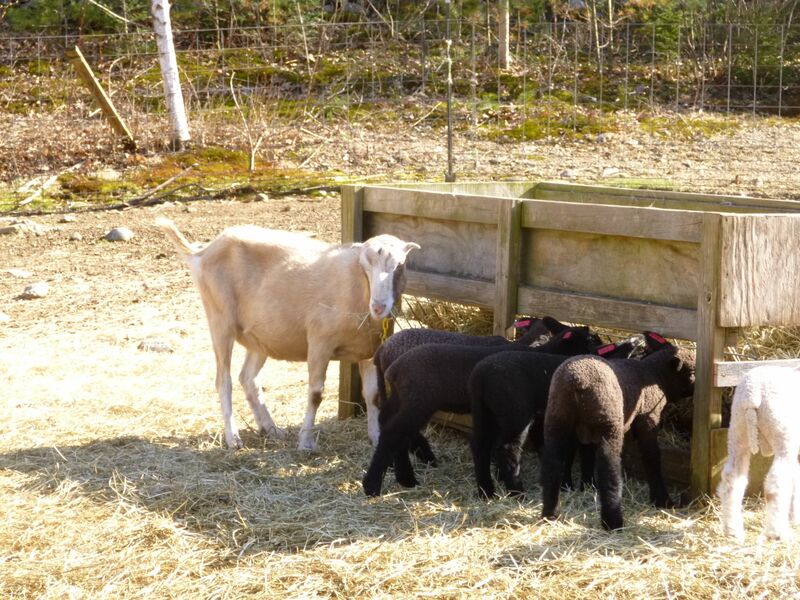 If our moms have had their booster within a month of lambing, I am not sure that I need to do it much earlier as hopefully they have passed it to the lambs before birth. So anyhow, today needed to be the day. We had a lovely visit from our grandson yesterday and then overnight, so I decided to try and grab the little ones in the creep this afternoon. 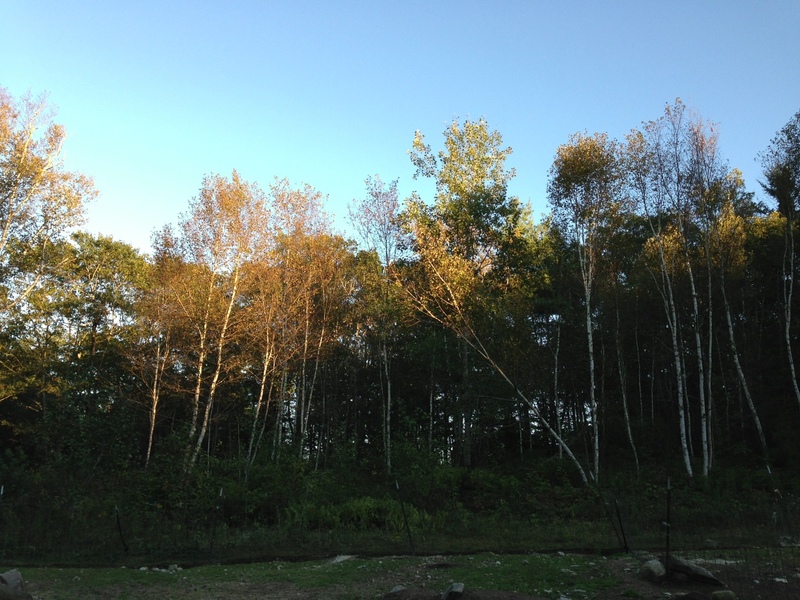 The weather is clear, sunny and cooperating. 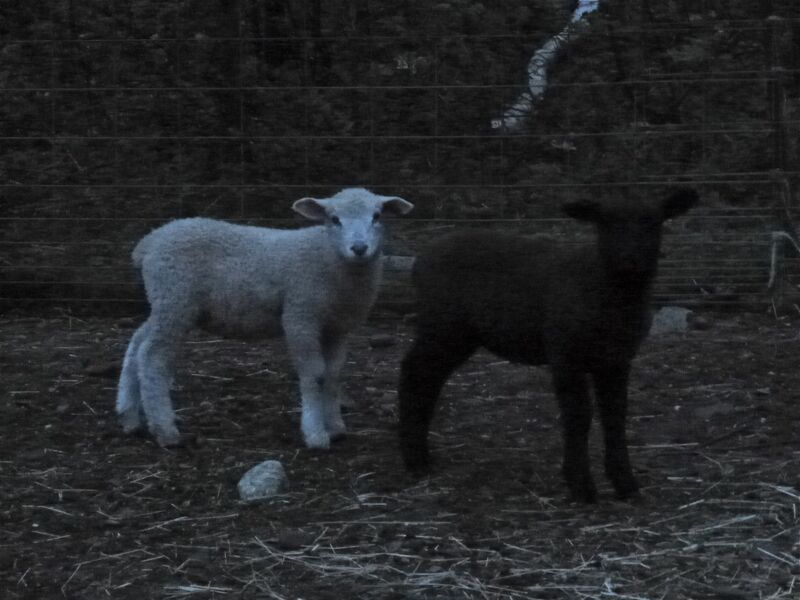 My biggest problem is that these lambs don’t ever seem to go into the creep all together at the same time. Other years I could just time it and wait until they were all chowing down, then pop a stop gate across the creep gate, and they are mine (bwaa ha ha!). 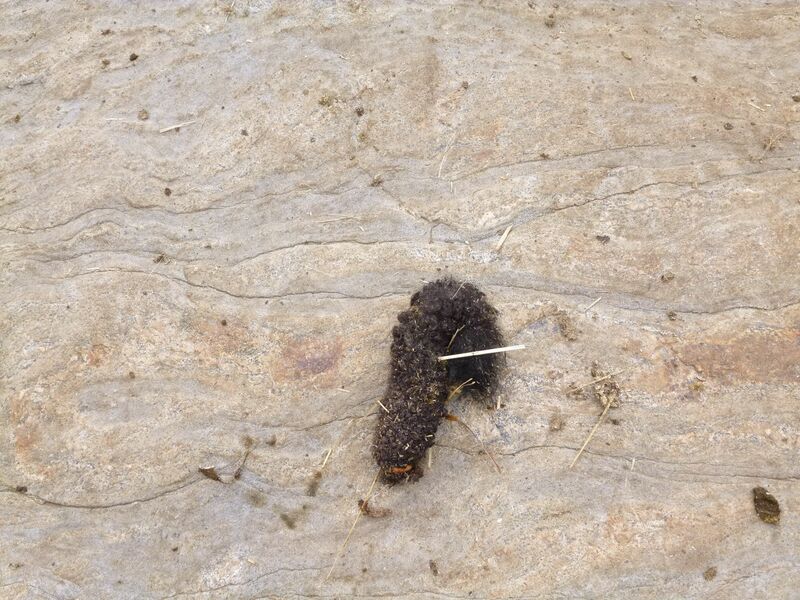 When I went out for chores this afternoon, armed and ready, I saw that 4 of the 6 were in the creep. Wow! I hit the jackpot. I only had to grab two and carry them in. Which I did in very short order, but holy crow, they are heavy! They have all gained the weight expected of them. 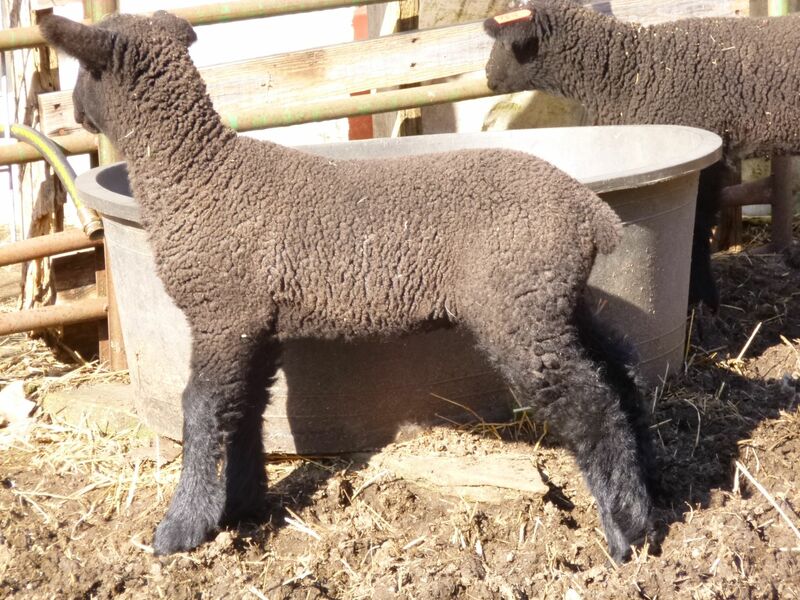 All the lambs are 29.5 to 37 pounds. Most are in the 30-32 lb range, We hope to see about a gain of a pound a day on average, and these babes are right where they are supposed to be. Little buggers did my back in, however. I am sore now. I couldn’t fit all of them into the 5 gallon bucket for weighing, and had to trick them into standing still in a sling. Ugh. I should be sitting in the tub right about now, and a massage wouldn’t hurt either! 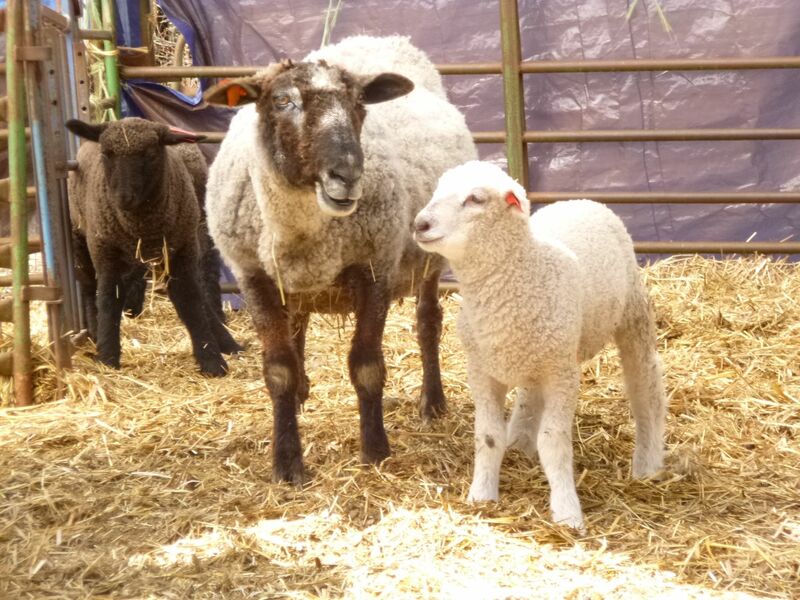 Our one and only ewe lamb showed up on Friday afternoon with her tail bobbed just like Bertie’s. 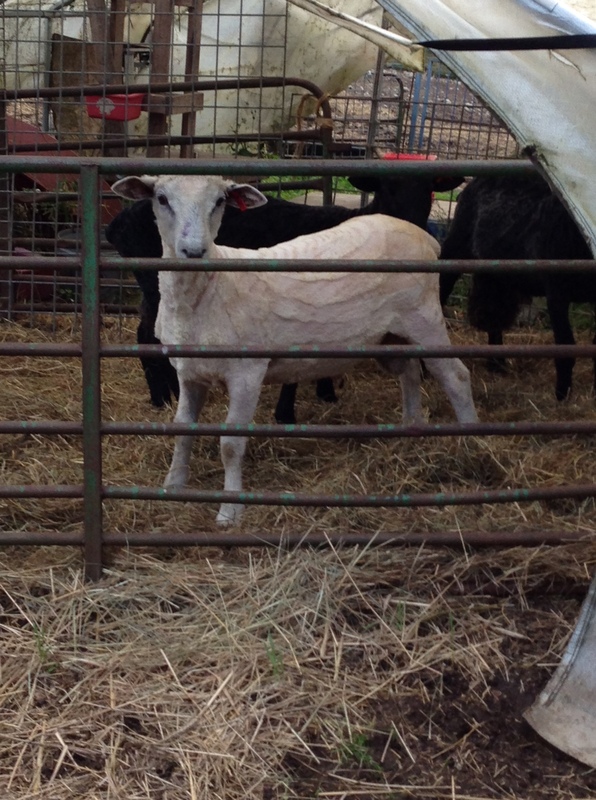 She is a beautiful ewe and I hope that she grows well. She is not sure that she likes or trusts Henny Penny, however! She was riveted to the fence as Bad Chicken was clucking contentedly on the other side of the barrier. So I got a chance to snap a couple of photos of her. She still does not have an official name yet. We are working on it. The first lambie tail has dropped off. 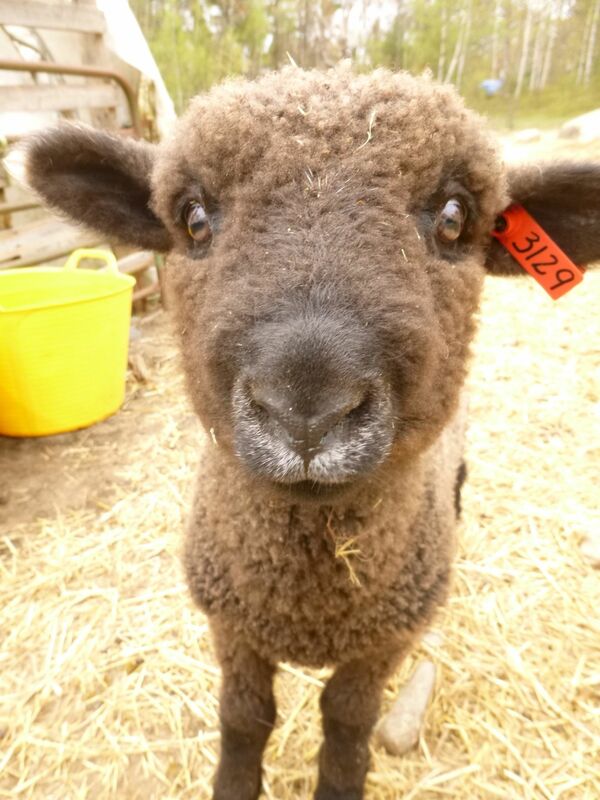 Our earliest lamb, HoneyBea’s boy Bertie, lost it some time during the day today. We band their tails with castration bands at 1-2 days old and the bottom part of the tail withers and falls off, usually in about 2 + weeks. It’s definitely given him that “big boy” look! Handsome devil! This afternoon I stumbled on it over by the big rock where the babies play. Hate it when the children grow up so fast!